After some days on the road we arrived to the Wadi Rum desert, a magnificent site where the nature shows all its splendour. 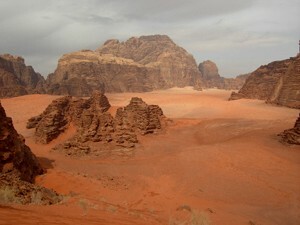 A land of big mountains, impressive dunes and Bedouins who follow the way of life of their ancestors. An almost perfect place to get lost in it. The south of Jordan, by Clara V.
We are again on the road, but like many times in few hours everything changes and sometimes it is too hard. This time the three days in the 5 stars hotel in the Dead Sea had ended, and it wasn’t easy to restart to cycle. 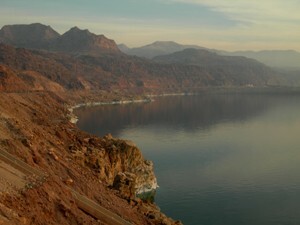 But at least the trip goes on through a land of big contrasts, crossing the fertile valley of the Jordanian river and skirting the Dead Sea. But the night comes and we have to look for a place to camp. This time is a Pakistani who receives us, a widower man and father of 11 daughters who offers us one of his tents to sleep. We have dinner together; some tomatoes, yogurt, olives and bread and then some tea. We try to understand each other, but it is very difficult we are tired, also because of the fatigue of cycling and the precariousness of the night. Luckily we go to sleep early but we have to improvise a covering for the door, because there isn’t one. 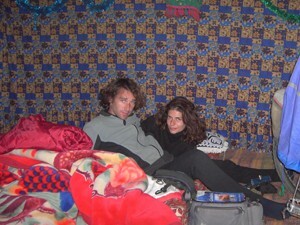 At 6 in the morning they began insistently to call us to drink tea. We could not believe it and we continued sleeping, but when the owner of the house saw that we didn’t get up he switched on the motor of his old truck in front of our door, causing an awful noise and that a cloud of smoke enters in our tent. And then Pablo asks me why I am in bad mood. And how many flies!!!! 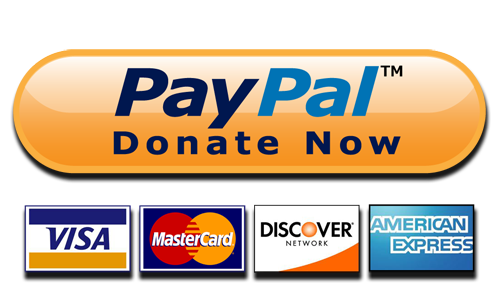 I would like to escape as fast as possible, but how can I do it by bicycle? Then we left, we cycled slowly and we bought some things in a small shop for our breakfast; then we began the interminable ascent to arrive to the Karak’s castle, situated to 1000 mts of height, through an endless and narrow corridor. There we stayed for a couple of nights because of a strong rain and wind tempest. Also there was too much fog that covered completely the city. We continued cycling through the King’s old road, the oldest road in the world, with some place covered by the snow and with too much cold weather. And with the unusual families that received us and who woke up us early to drink tea; some of them were really annoying. And finally we arrive to Petra, the city built in the rock. 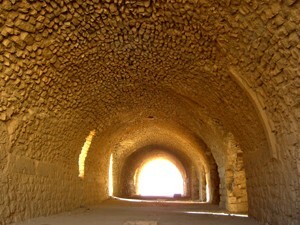 Many of fascinate of Petra derives of its spectacular placement in the depth of a hole in the desert. 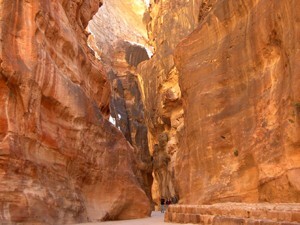 One walks in a canyon or siq, caused by a prehistoric earthquake, between rocky walls that rise until the 80 mts of height. The most famous monument in Petra is the Khazneh, the treasury that appears in an impressive way at the end of the siq, utilized for the final sequence of the film Indiana Jones and the last Crossed. Maybe that film stimulated my interest for the archaeology when I was child. Everything was fascinating. Petra is the legacy of the Nabateans, an Arab tribe that settled down more than 2000 years ago in Jordan which Kingdom lasted for diverse centuries; by this way Petra becomes an admired city, for its refined culture, for its imposing architecture and for its ingenious systems of dikes and channels. The decline of the Nabateans arrives with the arrival of the Romans when Petra was annexed to their empire. Many paths reveal hundreds of tombs built in the rock, facades of temples, and funeral rooms; There are also the big monuments like the theatre, the palace of the tombs, a monastery and a small sanctuary. It was the other big surprise. Way to the reserve of Wadi Rum we took a secondary road and at once a new scenario opened up; big mountains, plains of sand, impressive dunes and a blue sky as never we saw. When we arrived to the village we were thirsty so we entered to a market. Its owner was from Sudan and at once he began to chat with Pablo. I surprised myself because of Pablo is willing to speak with everybody, he never stops. I look at him and I admire him. “But how can he do?” I asked myself. “Does he never get tired?”. But also of that chat a good thing happen; the Sudanese guy told us that an Argentinean girl lives in the town, so we meet her at once. 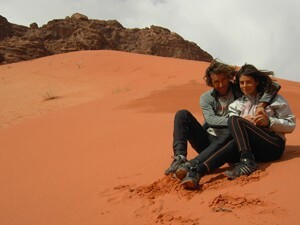 Maria is a 28 years-old girl who is in the desert since one year because of her relationship with Awad, a Bedouin guy. Immediately that she meets us she hugs us, as who doesn’t see friends since long time; she moves when Pablo speaks to her with Argentinean accent, she is happy and also us. Maria lives in a Bedouin tent, but more comfortable style because it has a refrigerator, a television and a Christmas tree. But she also uses firewood to do fire, which let her to warm and to cook. The last day when Pablo and I left the village Maria also left to Israel, but earlier than us, leaving Awad and escaping from that life. “Today only some Bedouins follow the way of life of their ancestors”. Awad told us. “Most of them have settled down in cities and towns and they belong to all the social classes, but the traditional black tents and the camels have not still disappeared of the desert’s panorama”. For many travellers to share a meal or a coffee with the inhabitants of Wadi Rum, to do a walk by camel or to spend one night under the stars in a Bedouin tent are one of the most memorable experiences; but I have never thought that I would enjoy the desert in another way. The best way to enjoy a desert is to get lost completely in it; and it was by this way, together to Maria and Awad that we stayed there for more than one week. We slept in different grottos which every time were more beautiful. We have slept in serene nights and in others where the fury of the wind, the rain and the cold weather were present. We have walked with Pablo and discovered new places and their beauty; we also got lost; but we always felt excited of that landscape. During those days I forgot who I was and the damage that I had caused to my mother after I left. There, in the desert everything was pure contemplation for that divine planet.